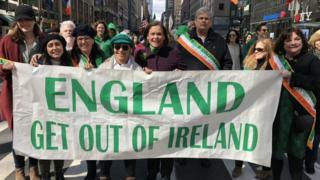 The Sinn Féin leader has apologised for marching behind an "England get out of Ireland" banner on St Patrick's Day. Mary Lou McDonald moved to reassure the public that its message was not directed at English people. "For anybody who felt that it was directed at English people, I just want to reassure them that's not the case," she said. Ms McDonald was condemned for posing with the sign last month in New York City's annual parade. Her actions were described as offensive and divisive by Tánaiste (Irish deputy prime minister) Simon Coveney. Speaking to RTÉ Radio 1, Ms McDonald said: "In respect of St Patrick's Day, I think it starts certainly a conversation around that banner which has been up and down Fifth Avenue for a generation. "It's a very direct political statement, it's an anti-partition statement. "Indeed I have blood relatives myself who are English... and English people are very welcome in Ireland. "Many of them live amongst us, they are our neighbours and our friends, so certainly I apologise to anybody who felt that the banner was intended in that way, and I'm happy to clarify that it's not."